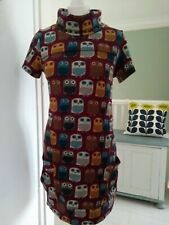 Funky Owl tunic dress with pockets. Labelled L.
Soft and warm. size XS (UK 6-8). 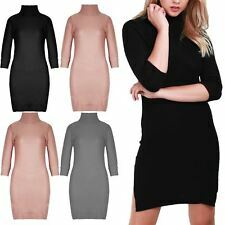 Ladies top - wear as a top or a mini dress. Thin jumper style fabric with cowl neck. Stretchy material and also has ruched stitching in back which gives it a nice fitted shape when worn. Please view all the photos too as they form part of my listings description. From a pet and smoke free home. Please check my other listings too as I am having a huge clear out and have lots of items for sale - including many unusual/boutique/occasion-wear items of clothing, and also some items new with tags including clothes, toys and gifts! I am happy to combine postage on multiple purchases - please contact me! Thanks for looking! It features a cowl neckline and has no fastening. It is made from a beige coloured wool material and would be ideal for different occasions. 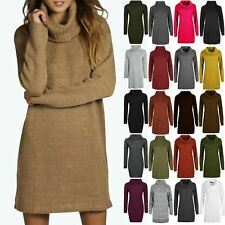 Style: Jumper Dress. Neckline: Cowl Neck. Material: Wool. 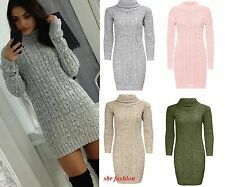 Melrose Jumper Dress - Size 12. Condition is New with tags. Dispatched with Hermes Tracked. With a beautiful tiger print on it. from designer "Izabel of London". a great buy! NORDIC JUMPER DRESS TOP (193). 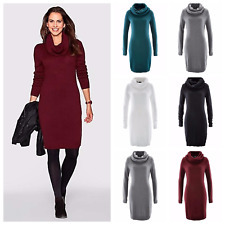 Enjoy your gorgeous jumper dress x. back to hem 30"/ 76 cm. armpit to armpit 19 "/ 48 cm. Paco black mix patchwork tunic dress. Patchwork panels. Cowl neckline. Finishes above the knee. Long sleeves. Designer green cowl neck tunic dress from Club L, bought in Debenhams. Great with leggings or as a mini dress. Laurel wreath design. The classic pique polo shirt is reworked into t-shirt dresses and blouses, as dogtooth checks give a nod to Fred Perry's mod roots. Colour: Black with white finishing. Waist (cm) 62 66 70 74 80 86.